I have scary memories of all of those “Cream of” canned soups. For some reason my dad used to love those canned soups. Depending on the day it could’ve been Cream of Mushroom, Cream of Broccoli, or Cream of Chicken. He’s probably eating one right now, actually. I’d watch in fear as he cranked open the can, plunked the soup into a pot (which of course, came out in a single can-shape), and added a can of milk to break apart the “soup jello”. I was not down with that, even at the wise age of 8. I always preferred to eat soup that didn’t come out in a single lump. Clear broths, like vegetable soup, were more my style. I also loved canned tomato soup like nobody’s business, especially with a million saltines crumbled over top. The saltines would get all mushy and saturated with tomato soup, allowing me to crush even more on top. Paired with a grilled cheese, that was just about my favourite meal as a kid. Even though I never did take a liking to those creamed canned soups, I will admit a creamy soup sounds so comforting this time of the year. I figured I could probably come up with something a lot healthier and less processed in my own kitchen. And with any luck…something that didn’t look like grey Jell-O. After the weekend’s crazy holiday hijinks, I was craving comfort food, but I also wanted something that snuck in a bit of green. My recipe brainstorming session was pretty short because I was working at 30% functionality. 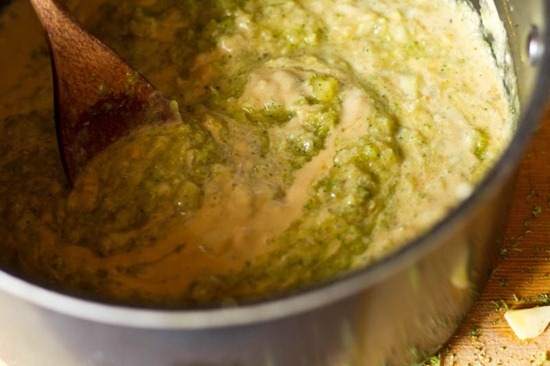 Idea #1: Roast broccoli and pour my 5-min cheeze sauce all over it. That sounded wonderful, but not quite a meal. 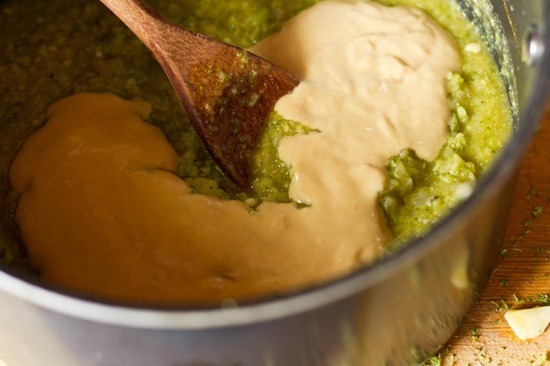 Idea #2: Make Cream of Broccoli soup made with cashew cream instead of dairy cream. I wasn’t really feeling the cashew cream though, so I tossed that idea for now. 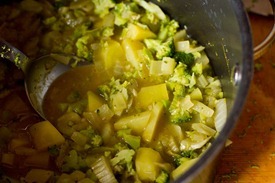 Idea #3: I combined my broccoli and cheeze idea with my soup idea to make creamy Broccoli and Cheeze soup. Idea #4: Toast bread and slather Earth Balance and garlic powder all over it. Forget the greens. Healthy comfort food at its finest! This soup combines my love for broccoli and cheeze sauce, while doing without the cream or cheese. The prep is quite lengthy due to all the chopping, so I suggest using an electric chopper or processor if you want to speed things up. I finished the soup with a sprinkle of smoked paprika and Daiya cheese. Enjoy with your favorite croutons or even some breadsticks for dipping would be lovely. I didn’t have any croutons so I just double toasted some bread, spread it with Earth Balance, and a sprinkle of garlic powder. Yum! 1. 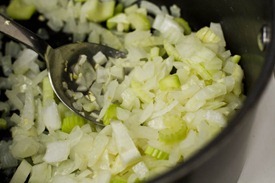 In a large skillet, heat the oil, onion, and garlic over medium-low heat, stirring frequently. Cook for about 5-6 mins. 2. 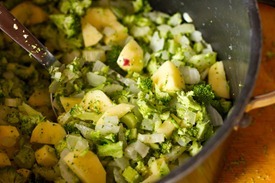 Add in the celery, broccoli, and potatoes and cook for about 5 minutes. Now, add the broth, nutritional yeast, and cayenne pepper and simmer for another 15 mins or so until the potatoes are just fork tender. 3. Meanwhile, prepare your cheeze sauce (see below) while the soup simmers. 4. 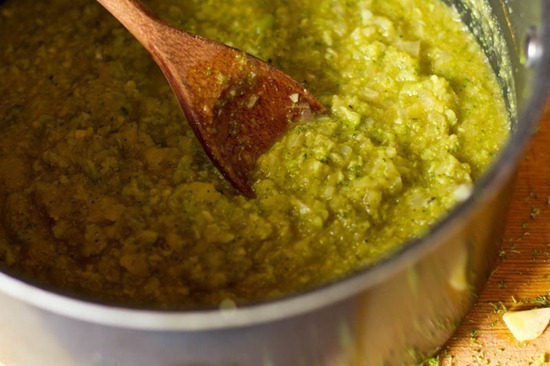 Carefully transfer the soup (in two batches) into a blender. Blend until almost smooth (I left it a bit chunky, but you can blend as much as you wish) and place back into the pot. Stir in the cheeze sauce, reserving 1/3 cup for later. 5. Stir in optional lemon juice, salt, pepper, and optional herbamare all to taste. Finally, stir in the minced parsley and spoon into bowls. 6. Top the soup with croutons, Daiya cheese, remaining cheeze sauce, and smoked paprika. This soup was quite a lot of work, due to all the chopping. If you want to save time you can use a food processor or electric chopper to speed things up. Or maybe bribe your loved one to do it for you? If you figure out how to do that, please let me know. 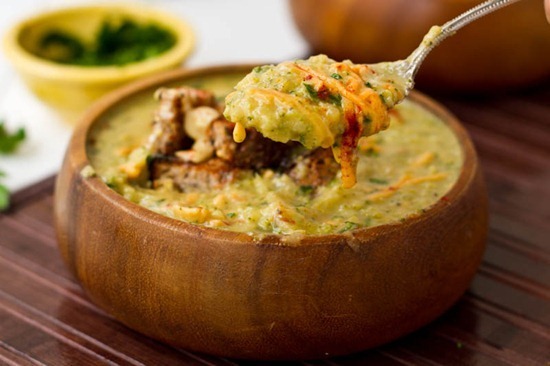 While the soup is simmering, make the cheeze sauce in a medium-sized saucepan. This sauce comes together in under 10 mins, so it’s the perfect busy work while you are waiting for the soup. Adapted from here. I basically just doubled my old recipe and added a couple extra spices. 1. In a skillet or pot, melt the Earth Balance over medium heat. 2. In a medium sized bowl, whisk together the flour and 1/4 cup milk until all clumps are gone. 3. Whisk in the remaining milk (1.25 cups) as well as the milk and flour mixture into the pot. Now whisk in the nutritional yeast. Reduce heat to low-medium. 4. Add Dijon, garlic powder, onion powder, salt and pepper to taste and whisk frequently over low heat until the sauce thickens up, for 3-5 minutes. Be careful not to burn it. Remove from heat once thick. Set aside the cheeze sauce, and carefully transfer the soup in a blender in two batches (or just use an immersion blender!) and blend until almost smooth. I left it a bit chunky, but you can blend as much or as little as you wish. I also stirred in about 1/4 cup of Daiya cheese, but that is optional. Add the rest of the spices and seasonings to taste. Serve with croutons, remaining cheeze sauce drizzled over top, a sprinkle of Daiya cheeze, and smoked paprika. Many of you may know that I use (and love) Recipage, the recipe organizational system for bloggers. I wanted to pass along the exciting news that Recipage is now FREE for all users! Want to see it in action? Check out my recipage and see how easy it is to search for ingredients, courses, and specific recipes. That looks thick, filling, and delicious. Thanks for the recipe! Your description of that canned tomato soup is right on – total nostalgia! That looks fantastic! I am printing that right now and making that very soon. Thank you for the recipe Angela. When I had my wisdom teeth out and could only eat liquids, broccoli cheese soup was my savior! I love that this one is cheesy thanks to nooch and daiya! Now that’s something I can get behind. This looks delicious!! And growing up, I was the same way! My mom and sisters loved cream of mushroom soup especially and I HATED it with quite a passion. Last year, a friend came over and offered to cook my roommates and I dinner. What does he make? A recipe form the campbell’s soup website…using cream of mushroom soup! I tried to hard to just be polite and eat it but so many childhood memories were flooding back to me! Wow, your soup is stunning! 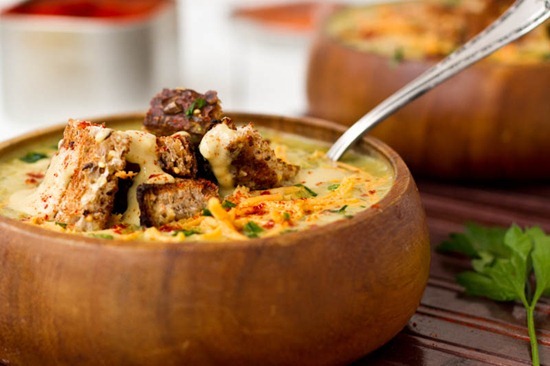 The pics with the croutons and topped cheese and that wooden bowl…I’d make soup just so I could eat out of that bowl! Hey — it not broccoli (though I do have that to use up in my crisper drawer), but it is green. I finally bought some kale and cooked it up last night (just olive oil, smoked sea salt, and some lemon). It was so good, I ate the ENTIRE pan. No joke. Good thing my husband’s on travel. If it weren’t for your blog, I would never have considered buying kale. Nice work!! I love kale prepared like that. It’s so simple and surprisingly good. I love that yours actually features broccoli instead of a few random sprinkles of green confetti like the canned broccoli cheese soups have. I have a Daiya version of the soup that I love, but this is awesome to have on hand if I don’t feel like a trip to whole foods for the faux cheese! 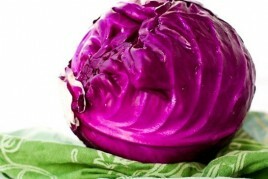 I’d totally do all my chopping for this in the food processor – that thing is a lifesaver!!! Sounds like a delicious, cozy recipe Ange. PS. 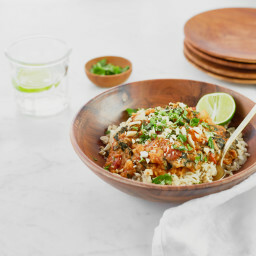 I LOVE your bowls – where are they from? I really am loving this idea…but I REALLY don’t like mustard. What do you suggest as a good alternative for mustard, while still keeping it a “cheezy” kinda sauce? Hi Carolina, I wouldn’t say that the Dijon flavour is overly pronounced in the sauce, but maybe you could make it without and adjust the seasonings to taste. I would also reduce the milk a bit too if leaving out the Dijon as it thickens it slightly. okay, i’ll keep that in mind, thanks! def making this looks amazing and i love wen i have all the ingredients! btw u totally hit the spot with the tomato soup crackers and grilled cheese, def makes me want some..my favoriteee! Hello! This looks delicious! However, I am curious…I know you have mentioned that you have IBS. If you don’t mind me asking, does broccoli not upset your stomach? 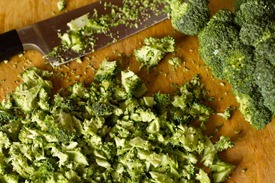 I can eat most foods, but broccoli is one that I need to eat in small quantities. On a separate note, I made your perfect veggie burgers again last night and they were a hit with our guests and even my meat-loving dad…and I always absolutely love them! Thanks for all of your amazing recipes, pictures, and inspiration! yes broccoli and cauliflower can be tough on my stomach! This one didn’t bother me as much, maybe because it was blended? For some reason I think of pairing this soup with some roasted mushrooms… mmmhhhhh…. This looks so thick and creamy…yum! 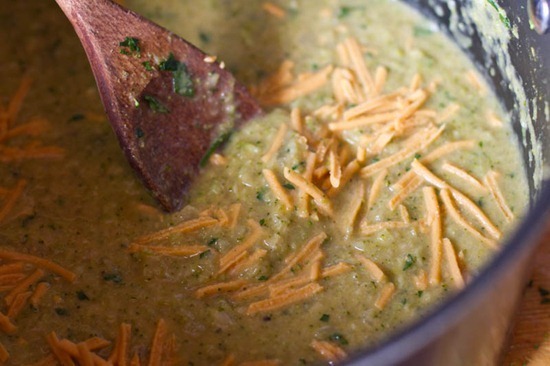 I ADORE broccoli and cheese soup…if I am gonna “cheat” it is on this! Can’t wait to try a version that doesn’t involve cheating! Broccoli cheese soup is my FAVOURITE!!! Can’t wait to try this lightened up version. These are some of the best pictures to ever grace this blog! Really? Wow, thank you my dear! Another winner. I am so making this this week. 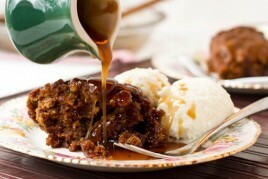 I just made the sticky toffee pecany thing two nights ago. (So light and not overpowering with the sweetness!) It’s like I’m becoming your personal test kitchen. I love that you post recipes with ingredients I either already have on hand, would get anyway during a grocery run, or isn’t too expensive or obscure if I don’t have it. I’m also loving this 12 days of healthy recipes thing. It kind of sticks in the back of my mind and reminds me that not everyone is letting health go during the holiday season. It’s like a mental support group reminding me to get my greens in, don’t forget the workouts, and offer to bring the sweets so I don’t have to “indulge” on white sugars and flours. Thank you for your comment! I’m so happy to hear that you are enjoying the recipes. It’s funny that you mentioned the 12 days of healthy recipes sticking in your mind, because I am finding the same thing. It’s a helpful reminder! your posts always make me think I could go vegan. If it weren’t for fancy cheese and honey-I so could. Are you a honey eating vegan or non honey eating vegan? There is QUITE the debate here in Bklyn about honey eating vegans. Hey Cat, I don’t eat honey. I thought I would miss it but with all the natural sweeteners I use I’ve found that it’s not a big issue. Obviously it’s a very personal choice among vegans. That looks scrumptious and so comforting! This looks delicious! I’ll have to wait until after the holidays to make it! That looks about 20x better than any canned soup! And I’m with you, a jello log of soup just won’t cut it. The real deal is so much better! I used to love Cream of Tomato soup when I was a kid too, but anything else? Nope. The idea of something coming out of a can in solid/gelatinous form makes me shudder just thinking about it. So thankful for posts like this one that offer healthy solutions to comfort food cravings! Oh my God! This is the most attractive soup I’ve ever seen! I usually don’t use vegan butter; do you think the sauce coud work without it? Thank you, Angela! Hey Elisabetta, Yes I think it would still work, just wouldn’t have that buttery feel to it. You can sub in any type of butter you prefer or probably just leave it out all together. You can sub a fat for a different fat in almost any recipe, so I’m sure that you could just use a tablespoon of olive oil or coconut oil, etc! Wow I love broccoli and cheese soup, thanks for the healthier vegan version!! Saute onions in oil or margarine. when onions are clear, add broth and bring to a boil. Add chopped potatoes and simmer for 15 minutes. Add Kale and simmer for another 15 minutes. Check the potatoes – they should be looking ready to be mashed (like mashed potatoes). Take a potato masher and mash through the soup a couple time to break the potatoes apart somewhat while leaving some chunks. serve with vegan cheeze to top. Ack! I know what you mean! I have a mortal fear of “Cream of” soups…ugh, they make me cringe! GROOOOOSSS!!! Your soup, by contrast, looks absolutely delicious, and the fact that its not loaded with gobs of cheese is awesome news, too! Can’t wait to try it! Da-rool! It looks so good and professional… almost unhealthy, haha! THIS LOOKS INCREDIBLE! I loooooove broccoli cheese soup! But I love broccoli and nutritional yeast even more! I am making this ASAP! yes, this definitely looks AMAZING. *picks up jaw from the keyboard* WOW!! 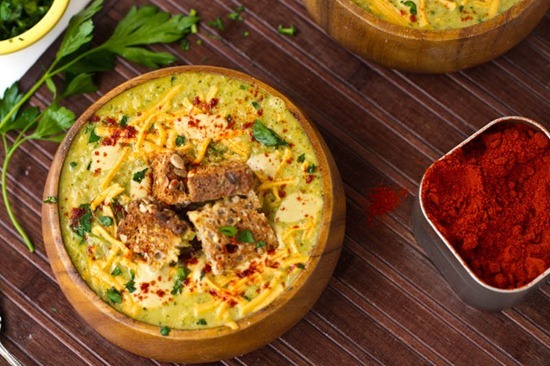 That has to be the BEST picture of broccoli and cheese soup I have EVER seen!! Hey there, Angela! Top marks on the photography for this post! Very impressed with the first soup picture, in particular. Hope you and Eric are doing well and enjoying the festive season. Love, your English follower. tomato soup,saltines, and grilled cheese was my childhood fav too! Oh wow, that looks amazing! I made a similar recipe last month using almond milk and extra veggies like blended carrots and celery and it turned out so well! Yours looks amazing, great pictures! I think I still have a mini gag reflex to “cream of” soups – It might just be the name, because I like creamier soups now, but I have so many memories of totally strange ones growing up! This recipe looks and sounds delicious – can’t wait until I have time to try it! Tomato soup and grilled cheese is tops! Your soup looks AMAZING! how delightful! 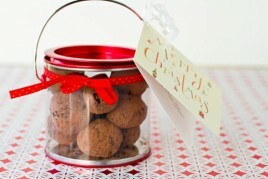 The photos make me want to reach out and grab a spoonful right out of the screen! This sounds delicious! My Mom loves broccoli cheddar soup (not from a can!!) I recommend using an immersion blender though if you have one! They are magical! I have had a few disasters with hot soup and blenders, and the immersion blender is just the solution! This makes my mouth water and looks like the perfect soup for a cold day. Also, your first picture is beautiful…love the wooden bowl! You were perceptive. I didn’t notice how gross the soup was when I was a kid. Im surprised I noticed too! Amazing!!!!! Dollface….this looks like real cheese soup! I’m in LOVE!!! I embarrassed to admit this, but I used to LOVE canned cream of mushroom soup as a kid. Thankfully I’ve seen the light and don’t eat it anymore. ;) I still love a good healthy homemade cream soup though. This looks great! YUM!!! This looks delicious. I want this for dinner! This looks really good! I’m ashamed to admit that I still use cream of mushroom soup occasionally, like in tuna & noodle casserole or green bean casserole. It’s just so comforting and reminds me of when I was little :) I’ve never liked the canned cream of soups on their own, though. I used to love it in casseroles too! I guess all mixed up it was fair game..ha! I’ve been wanting to find a vegan broccoli & cheeze recipe! So excited to try this. I too have had many scary canned soup nights. Yikes! Not here with this one though that is for sure. That soup looks absolutely, ridiculously, scrumptious!!!!! I can’t wait to try it! Wow! This recipe is exactly what I was craving! :) You seem to always have the best recipes at exactly the right times. What a beautiful soup! 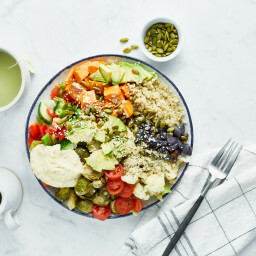 I love the photos and I love the croutons on top! Looks delish! Oh man this recipe of yours came at the right time! I do eat meat and have been making beef stew over and over the last few months but I have really, really been craving a hearty, comforting, vegetarian stew/soup. This looks like it will 100% fit the bill! Thanks! I really cannot wait to tackle this! Eek, memories of canned creamed soup- that thick goo- just picturing it in my head gives me this willies. Your creamed soup is MUCH prettier (and surely tastes 1000x better)! Wow, that looks so good! 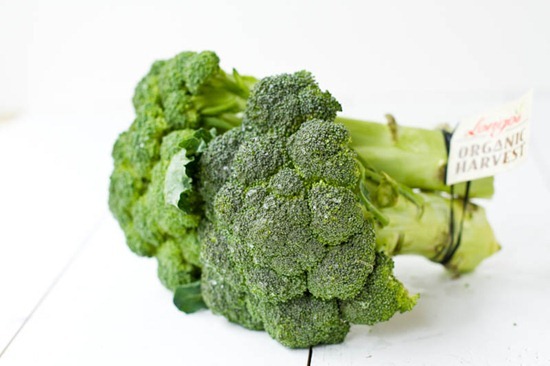 I have a ton of broccoli sitting around from our CSA- this is the perfect recipe to use it all up! I made this soup for lunch and loved it! I used a food processor and immersion blender which helped make this a fast soup to put together. And the cayenne pepper in it helped clear up my poor sinuses. : ) Thanks for the great recipe! Im happy to hear that Beth! I just made this and used cauliflower instead of broccoli and added a few chopped carrots – it was amazing. Looking forward to reheating the leftovers! Excellent comfort food. I need to start getting ideas together for a mac n cheeze cook off, thanks for the head start! Tomato soup and grilled cheese is one of my fav meals! This sounds delicious too, though I might take your advice and blend everything first to save chopping time. I wonder if something like this would work in a creamy mushroom soup. I made this soup last night, and it’s honestly the best soup I’ve had in ages. I LOVED it. The addition of the cheeze sauce was genius. And the ‘croutons’ on top were a lovely addition. I am most DEFINITELY making this soup! It looks sooo good. I used to love creamy soups as a kid, so this is right up my alley. Once again, Ang, you are a GENIUS! I’ve been sad without my broccoli cheese soup at my favorite coffee shop/bakery this fall, because I don’t want to to deal with the stomach issues from the dairy :-( Looks like I will have to roll up my sleeves and give this recipe a shot. the photos are awesome! Made this today. So yummy! Thank you! Made this soup today!!! LOVE IT! Thank you so much for amazing and yummy recipes!! This is definitely going on my “recipes to try” list. Hopefully this weekend when I have time, lol. I tried your walnut lentil loaf for Thanksgiving–it was fabulous! I’ve been having great success with all of your recipes lately, especially with my husband. This was another definite winner, so tasty!! We are both very excited for the leftovers. Hope your Grandfather continues to improve :) Merry Christmas!! I’m trying this as SOON as I get back in my kitchen after vacation!!! Thank you for a great vegan version of my favorite soup? I saw this recipe this morning and couldn’t wait to try it out! So I stopped at the grocery store for broccoli on the way home from work and got to it. Halfway through chopping, I realized that I only had about a quarter of a cup of nooch! Not to be dissuaded, I skipped the bit that goes in with the veggies and put the end of the jar into the sauce. Then I added a big handful of cheddar daiya into the sauce and whisked so it melted in. I skipped the cayenne because I don’t care for it, and used a little fresh basil instead of the parsley because I had it on hand. The lemon juice is a brilliant addition – it really brightens up all the flavors. Totally delicious and comforting. This soup was great! Great job! My 7 year old and 6 year ate it up. And, now I can make broccoli cheddar soup without velveta!! Thanks again! That is some really nice looking broccoli soup! Hi Angela! This soup sounds so freaking amazing and I can’t wait to make it tonight for me and the Hubs. 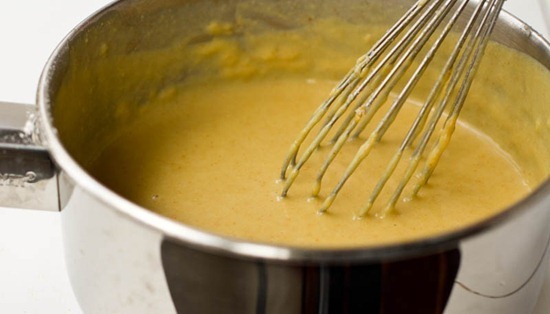 I don’t have a stand-up blender or even an immesion blender (weird, I know) so I was wondering if you think using a hand-held mixer would work too in order to blend the soup and cheeze sauce? I used a handheld blender and it worked perfectly….I just stuck it right in the pot so I didn’t have as many dishes to clean. Made this the other night and it really is a lovely soup. It’s perfect comfort food on a wintery night…don’t forget homemade, crispy croutons…mmmm….can’t wait to make it again! Looks incredilbe yummy. Will try it for dinner tomorrow. I used to make this soup with cream cheese back in my vegetarian days and really missed it since going vegan. Thanks, Angie, for bringing this delightful soup back into my life LOL ! thanks for sharing this great recipe. I made it yesterday evening – after a few days of rather poor food choices (I was just too lazy to cook) I felt it was about time to get back on track. The soup turned out very tasty – it was the first time I ever made a vegan cheese sauce YUM. I left out the celery, though, because I don’t like the taste and I only had sweet potatoes on hand, so I used them. Hey Stefanie, Im happy to hear you enjoyed the soup! I made this for dinner tonight and my husband and I loved it! It was absolutely delicious. Creamy, filling, rich and healthy. So tasty! Thanks for the recipe and gorgeous pics! I finally made this soup and it is great! I love the cheeze sauce with the broccoli and other veggies (though my fiance said he tasted something he wasn’t sure about….. not that it stopped him from eating it two days in a row. I told him it was the mustard). Yum! Does anyone know if this would freeze or can well? I have loads of Broc that needs to be preserved and I love the idea of doing a soup to have in the fall or winter. Hi Amy, I’m sorry I’m not sure as I haven’t tried freezing it before. If you do try it please let me know. Someone might have mentioned it in the comments too, so it might be worth scanning to see if anyone reported freezing it. goodluck! We’ve frozen it before, and it turned out well when thawed and reheated. It’s a favourite in our home. Glad to hear that Leslie! “I’d watch in fear as he cranked open the can, plunked the soup into a pot (which of course, came out in a single can-shape), and added a can of milk to break apart the “soup jello”. Most soups tend to freeze quite well, so I would guess this would be fine too! LOVE IT!!! I have had a pregnant craving for broccoli and potato soup for days and this hit the spot:) My 2 year old even loves it! I will be making a big batch to freeze for after our newest addition arrives in a few weeks. Great recipe, super easy! I found this recipe an hour ago and HAD to make it immediately. I just finished my first bowl…WOWZA! I will be sneaking this into my Thanksgiving casserole for sure! I added a heaping tablespoon of Vegenaise to cream it up a bit more…I do this to all of my creamy dishes and it works wonders. mmm veganaise would be amazing! Hi! So I tried the broccoli and cheese soup but it turned out bland. I did use frozen broccoli so maybe that was why. Has anyone else tried this recipe with success? All the other recipes I have tried were amazing!! Hi Renee, Do you think the frozen broccoli may have diluted the soup? Maybe it would benefit from extra seasonings or a bit of vinegar to finish in this case. Goodluck if you try it again! This was an absolutely delicious soup! Very hearty and filling. I made a savory cornbread studded with roasted corn to go along with it. It was actually pretty easy and quick to come together – since I knew I was going to blend it, I chopped everything fairly large. Thanks for a great recipe! I just made this soup and it’s a keeper for sure! My husband, who is almost anti-vegan, liked it too! Thank you. I’m new to your site which I love by the way. I made this soup tonight and it was out of this world. My husbands first words were you have to make this again. I made it without the potatoes because I didn’t have any, and it was still really creamy and delicious. Thanks for the recipe. Hi Angela, just made this soup and it is absolutely fantastic!!! I’m finding that I spend more time on your blog now than any other, and I’ve made well over 10 recipes now that all have been exceptionally delicious! Really, I don’t know how you do it but your recipes are guaranteed hits not just with me but with my husband, who each time I have made something from your site tastes it, shakes his head and says “Is this REALLY vegan?” It makes me laugh each time, and this soup was a big hit with him as well as with me! Thanks again!! This soup is sublime! It’s creamy, a little spicy, really delicious! Thanks so much for sharing your recipe! My husband loved it! 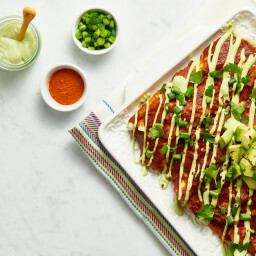 I know this recipe is old, but I’m a new vegan and I just stumbled upon your site a few weeks ago. I am eating this soup right now, and I just couldn’t help but leave a comment over how delicious it is! I love it. Also, I saved some of the cheese sauce to make a spaghetti squash “mac & cheese” tomorrow! My taste buds are so glad you do what you do! EVERYONE loved it. made it for the whole non vegan family. 2 -7 year olds and non vegan hubbie..!! So glad to hear this Amanda! I made this soup and the 4 layer avocado sandwich for supper and even my omnivore hubby LOVED them both! Woot! These are dishes I’ll be making over and over again. Just came across this soup and it looks delicious! I want to make this soup for dinner tomorrow but I was wondering what your take is on me substituting the potatoes with sweet potatoes? Do you think it would work? Thats a good question – to be honest I’m not sure! It’s worth a shot probably. Or you could sub half the potatoes for parsnips too? I made a modified version of this last night and it was delicious! I’m so excited I made enough for leftovers today for lunch! Thank you for bringing broccoli cheese soup back into my life, it’s something I thought I’d never have again after giving up dairy and meat! Fantastic Soup! This is the best broccoli cheeze soup I’ve eaten. I’ve been struggling with turning vegan and haven’t been able to get the “right” taste yet. This soup did the trick. It was one of the first times I didn’t miss dairy. I hope this is in your upcoming cookbook. Made this tonight. It was a big hit! Some liked it with the smoked paprika, but most preferred it without. Made the recipe but substituted canned chickpeas for potatoes and it turned out great! Was initially dubious regarding the nutritional yeast but am a convert now! Love this site and colorful photos! Yum, super Delish. I used sweet potatoes, it’s all I had on hand. Satisfied my craving. Thanks for an easy yum recipe. This is one of my favorite soups I’ve discovered since changing my diet! My husband and I love it! I did add a little extra dijon mustard to the soup though! My husband loves this soup too! Just made this soup (2+ years after everyone else) and it’s divine. I don’t know if my nonvegan boyfriend will agree … he was excited to hear I was making Broccoli Cheese soup and triple-checked that it was going to be “real” … but if he doesn’t like it, alas, more for me. We didn’t have raw potatoes but did have leftover roasted yukon golds, so I chopped and added those. I also used the broccoli stems after trimming the funny-looking bits off. The food processor makes this very easy to prep. I pureed about 3/4 of it and left the rest chunky, as I like texture. It’s very, very thick. I like my soup a little “spicier” so added more cayenne. I am this minute finishing my first bowl and resisting having a second! Now I HOPE we get more broccoli in our weekly farm box, rather than dread it! Thanks, Angela. So glad I stumbled across this recipe! Just made it and it’s delicious :) thanks! I too ate lots of cream of…..in casseroles. Never did care for those either! Your soup, like all of your other dishes looks fantastic! When making the cheese sauce, would it still come out good/the same if I left out the Earth Balance? I eat WFPBNO. I always sub oil for broth but not sure on this butter thing. Thanks! And Thank You for your wonderful recipes! Wow this is great! worth the effort- very comforting! This was a wonderful recipe. My daughter even loved it (and took seconds) and she usually turns up her nose at anything “vegan”. :) Thank you so much for your website! I love following along and being able to make delicious nutritious food for my family. This was yummy! It especially gets better the longer you eat it. I would def make again! Thanks! I love your recipes and use them to make my weekly meals beforehand. This is one of the few recipes that didn’t work out for me. I’m not sure if it’s the nutritional yeast, but the flavor is very off putting and the result was a bit watery. Any advice? Your recipes never fail me! I was looking for a broccoli soup that was dairy free but still creamy delicious and this is it. Also, I can’t wait to douse some roasted broccoli with that cheeze sauce soon. So good. Thanks for sharing! I cooked this for my family last night/ it was amazing! I have been craving this soup that places do not sell gluten or dairy free/ but that’s ok now bc this one is way better! I used sweet potatoes and left it chunky. Great job Angela, it’s now one of my fav soups! And it was easy! Just made this (a few years late!) And its unbelievable!!! Reminds me of broccoli cheddar from my panera pre-vegan days!!!! 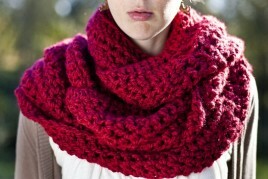 New winter staple for sure!!! I made extra Yukon gold potatoes and mashed them up on the bottom of each bowl with a little salt, pepper, and earth balance since I didn’t have croutons or bread. I followed the recipe for the soup almost exactly and it is absolutely wonderful. I just made this for the same reason you mentioned in the blog – post holiday, still in need of comfort food but desperate for more veggies! It was getting a little non veggie carb heavy over here. Thanks for keeping me happy and healthy! I made this last night and it turned out great! Just blitzed it with my immersion blender without dramas. I will definitely be making it again! The only thing I would recommend to others would be to perhaps just add the 1/4 tsp cayenne to the soup or cheese sauce initially, and then add more if you feel you need it. I found adding this to both components made the spice overpower the broccoli and it’s more like spicy cheese soup. Still delicious though! Thanks for another great recipe! AMAZING RECIPE!! I made this Broccoli and Cheese Soup recipe and served it in bread bowls. Turned out to be one of our family favorites instantly. I love the cheese sauce recipe and plan on using it again on taco night – just adding some spices to turn it up! Thank you for all of the great dairy free recipes! Your Mac & Cheese is awesome too!! 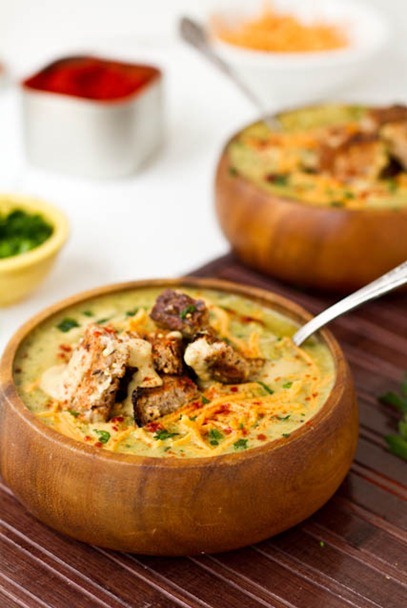 Two great recipes in one with this soup. I’ve just made it and thinking about how else I might use the cheese sauce. Most delicious! I added extra cayenne and I highly recommend this. 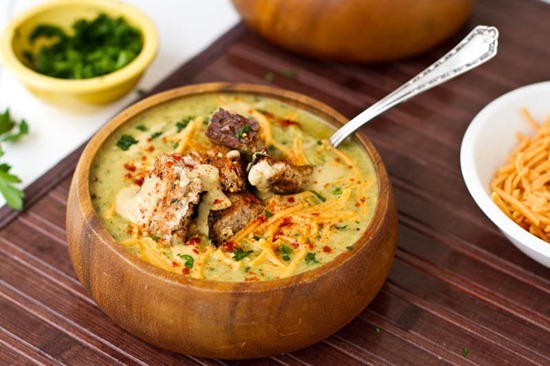 I am absolutely making this soup tonight after work! I’ve made soo many of your soups in big batches to take for work lunches throughout the week and I currently have all the ingredients for this one!I :D Next up will be your tortilla soup…mmmm can’t wait to give it a whirl. I have yet to be disappointed with a recipe.. This soup was amazing! I made it for me and my non-vegan boyfriend tonight and we both agreed that it was the best soup that we have ever tasted! It was perfect on a cold night! This is th ebest soup ever! And our 6 years old kid loved it too! I replaced the celery with fresh lovage leaves from our veggie patch. This soup was a big hit! My husband and I both loved it. It was surprisingly quick and easy to make on a weeknight! I used two decent sized russet potatoes and two bunches broccoli, and the pot was stuffed to the gills! Because of all the veggies I decided to toss in an entire container of veggie stock (32oz) and it worked perfectly. The cheeze sauce was also to die for. Don’t skip the lemon juice – that really enhance the cheesy flavor! I luckily had an end of a several day old baguette that I chopped up and tossed into the oven for croutons. Didn’t have any parsley or daiya but smoked paprika is my favorite spice so that was a perfect finishing compliment! We will definitely be making this one again – I feel stuffed after two big bowls but not bloated like I would after a bit of dairy soup! I made this yesterday and I replaced the flour with cornstarch. I felt that it tasted too much of nutritional yeast. And I love nutritional yeast. Forgot to mention that not only did I use broccoli but cauliflower as well since it was about to go baf, still a winner! Omg sooooooo increasibly amazing. Can not stop eating it. Can this soup be frozen? Looks delicious! Lol, our secret, Nia! ;) So glad the soup’s a hit. Hi! I am dying to make this soup, but I have to avoid almond milk because of a nut allergy in the family.What would be a good nut-free substitute for the almond milk? You could probably use an unflavoured unsweetened rice milk, or maybe oat or quinoa milk? I haven’t tried either though. Let me know if you try anything out!